Services, Quality, Culture, Process and Results. 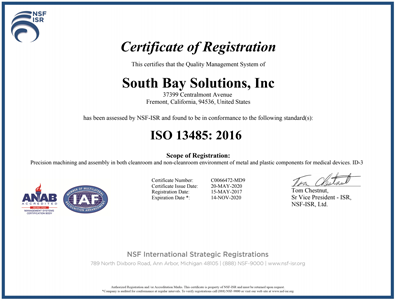 Today South Bay Solutions offers the state of the art in outsourced manufacturing of complex assemblies. Our automated materials management, planning and supply chain tools are considered a benchmark for the industry. Our Level of control not only assures on time delivery to our customers, but allows detail information from the quoting stage and throughout the manufacturing process for every product. Our Quality Assurance staff uses a complete range of computer and conventional measuring equipment, performs first piece first article, in-process and final inspections based on AQL level and/or as requested by our customers guidelines. Parts are made using standardized operational routines with conformance to print dimensions checked at each step in the manufacturing process. 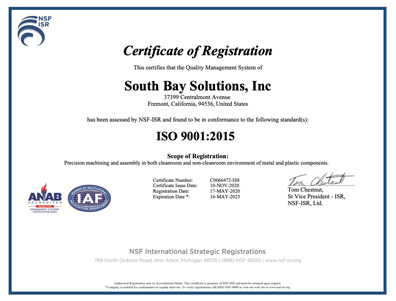 © 2019 South Bay Solutions, Inc. All rights reserved.